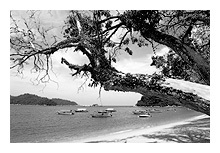 "Selamat Datang", welcome, Pangkor Island my hometown located on the west coast of Malaysia. Nicknamed Pearl of the Strait. Pangkor is a peaceful island that offers plenty of lush tropical greenery, friendly fishermen, pristine beaches and escape from the hustle and bustle of the city. 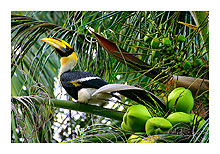 No wonder the beautiful Hornbills which is unique to this island call this home! For years I have been amazed by the unspoilt beauty and simple lifestyle of Pangkor and thus I become a serious photography hobbyist, tying to capture all those wonderful sights and moments for my own collection. Eleven years ago, with my niece's help, Pangkorisland Dot Com was created, mainly to share with the world what Pangkor has to offer through a Pangkorian's lenses. Over the years I have captured thousands of photos of my beloved island in different photographic formats (large/medium/135mm etc) and these few hundred selected photos were taken within these recent 3-4 years with Canon digital cameres. However, I have reserved my best photos for an exclusive photography book of Pangkor, hopefully to be published this year 2009. If you find my hometown attractive enough, you are of course welcome to visit us. 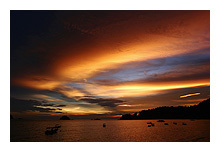 After all, Pangkor Island like many other lovely places is a gift of God for all to share. Website is under maintainance at the moment. More new photos will be up soon. 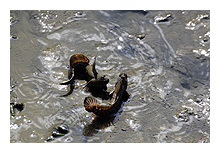 The photos/images on this website are for personal use and viewing only. All images/photos are copyright reserved. Re-posting and/or re-production in any manner without proof of written permission of the owner is strictly prohibited. All photos Copyright © 1998-2009 Eddie Neoh.